A novel-in-novellas I wrote (Dzanc Books) with Nik Korpon, Caleb Ross, and Axel Taiari. I finally had a moment to sit down with Robb and Livius to discuss The Soul Standard (Dzanc Books), my latest project, a novel-in-novellas, written with Nik Korpon, Axel Taiari, and Caleb Ross. We talk about how the book came to be, my novella, Golden Geese, how the stories linked up and our process for that overlap, and much more. Stop by and give it a listen. Axel Taiari shares this episode with me, to give us his stories. To hear Nik and Caleb talk about their stories and process, GO HERE. To hear the original review by BOOKED, GO HERE. Had to take a moment to share a new review of The Soul Standard (Dzanc Books) which is officially out on July 26th. Not only does This is Horror love the entire novel, but they had some kind words about my novella, Golden Geese. Order you copy today! I mean, it doesn’t get much better than that, right? The Soul Standard is a TOP TEN pick for July at Chicago Review of Books! Chicago Review of Books has The Soul Standard as one of the TEN BEST SCIENCE FICTION & FANTASY NOVELS TO READ THIS JULY. How exciting. In great company, too. Forget the flippant summer beach read. Ring in the dog days with these 10 science fiction, fantasy, and speculative novels picked as July’s best by the Chicago Review of Books. From dark, masterfully constructed plots to stories that probe the human condition, the following books will keep you perplexed—and bewildered—until the leaves begin to change. Out soon, but you can pre-order it now. 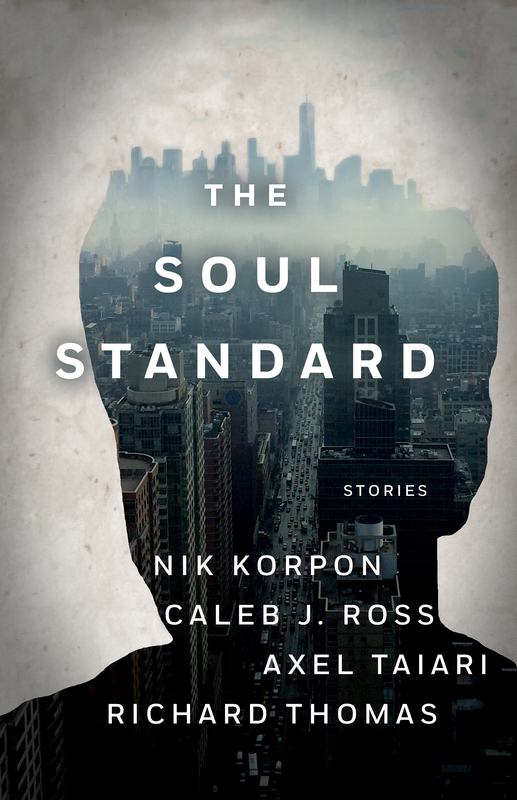 Told in rugged, bare-knuckled prose, The Soul Standard is a nonstop thrill-ride down the darkened avenues and through the shadowed alleys of a nightmare town. Excited to get one of the first early reviews of The Soul Standard (Dzanc Books) a novel-in-novellas that I wrote with Axel Taiari, Nik Korpon, and Caleb Ross over at Booked Podcast. This has been a long time coming—so thrilled that Dzanc Books believed in this project and that it’ll be out soon. It’s Sin City meets Raging Bull with a hint of The Machinist. FULL DESCRIPTION: Across four different districts of a city that has torn itself to shreds, four different interweaving tales (each written by a different author) play out. In”Four Corners,” a morally dubious banker must keep his employer happy at any cost. The next story, “Punhos Sagrados,” concerns a boxer who finds himself torn between honor and the woman he loves. “Golden Geese”follows a hardened criminal with a terrifying condition who must come to terms with the life he’s led. Finally, “Jamais Vu” provides a stunning denouement as a man searches endless for his missing daughter, a task which is complicated by a peculiar condition: his inability to recognize faces. Told in rugged, bare-knuckled prose, The Soul Standard is a nonstop thrill-ride down the darkened avenues and through the shadowed alleys of a nightmare town. Cover Reveal for The Soul Standard (Dzanc Books)! Exciting cover reveal for The Soul Standard (Dzanc Books) out this July. Written by myself, Nik Korpon, Axel Taiari, and Caleb Ross. It’s four linked novellas over four seasons in four different parts of the City by four different authors! Kind of a Sin City vibe. Thrilled to be working with Guy Intoci and Dan Wickett, two of my heroes. DESCRIPTION: The economy has fallen, and flesh is worth more than dollars. Across four different districts of the City, a desperate banker must keep his employer happy at any cost, a boxer must choose between honor and the woman he loves, a criminal must atone for his past, and a man with a terrifying condition searches desperately for his missing daughter.